Did you know that your exterior appearance is one of the first things that can make an impression on your potential customers? That’s right, the overall cleanliness and professional look of your parking area can impact your bottom line. If the area is filled with debris, dust or litter, it will make the bad impression. Well maintained and clean parking area and sidewalk, are both important key in making the best impression in front of your customers. Aside from the fact that parking lot cleaning is a good management practice, it is actually a crucial element in positioning your business and brand – just ask us! Parking lots can get heavy traffic and the people using the area sometimes think the parking lot is their own personal trash can. An unkempt parking lot will not only reflect bad on your business, but, it can lead to various other problems, too! In fact, if people start falling or tripping your parking lot, you may be just a couple of legal suits away from bigger issues! It makes a good first impression: Whether or not customers realize it, your parking lot can impact how they view your brand, quality of service, trustworthiness, professionalism, cleanliness, attention to detail, and even your stances on environmental responsibility. For this reason, it is imperative to keep your parking lot clean and free of trash or debris. A clean area mitigate the chances of having pests: The accumulation of trash becomes a feeding ground for disease-rodents and other animal. These animals are unsanitary and can be dangerous. If once your property infested with rodents or rats, it is very difficult to remove them from your premises. So, it is better to clean the parking lot area by hiring a professional cleaning service. It prevents the business from a bigger liability: Large debris can cause major issues other than damage to their cars and tires. As mentioned before, in addition to losing valuable customers, you could wind up with lawsuits and liability claims against you. Shows you care about the neighborhood you serve: How you view your surroundings echoes how you view your own setting. Let us show your commitment to your property and neighborhood morale by making your parking lot safe, clean, and appealing at the first glance. It extends the life of asphalt: Like the rest of the improvements on your property, the better care you give to your asphalt parking lot, the longer it will last. Keeping pavement free of debris and sealing cracks and joints annually will help prevent standing water that can cause further damage. Keep your property looking its best: Implementing a regular maintenance schedule for cleaning your parking lot will ensure that your brand’s image isn’t tarnished by an unappealing parking lot. Your old and new customers will be satisfied with a well maintained area. It will also allow you to preserve the integrity of your property. When it comes time to clean the parking area, just remember that More of Clean of Texas should be on your team. We create customized, strategic cleaning plans that are designed to fit your needs. 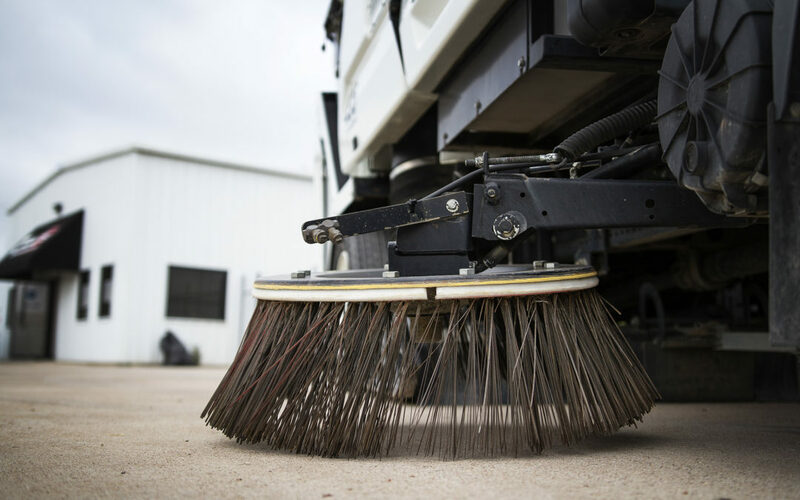 Our parking lot cleaning services include: hand-blowing sidewalks and inaccessible area, emptying and relining trash cans, handpicking planters and surrounding area, and of course, sweeping. Whether it’s a shopping mall, strip center, apartment building, healthcare facility, education institution, or any other building, we will help protect your business’s image by getting your parking lot in excellent condition. Don’t miss our next blog in October featuring Fall Commercial Property Maintenance Tips from your friends at More Clean of Texas!